NE: Noble Corporation (NE) is an offshore drilling contractor for the oil and gas industry. Risk: You need to further evaluate NE thoroughly. Well-informed, you decide what to do. Remember that there is risk of loss in all trading. I don’t own any NE shares. Here are the pluses and minuses. 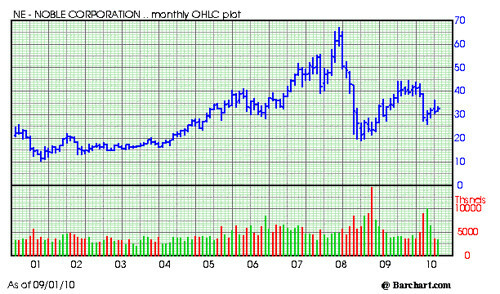 – Dividend: On 8/19/10, the quarterly dividend was 12.53 per 100 shares (0.38% yield). – Earnings: For the third quarter 2010, analysts estimate NE will earn $0.78 per share, a decrease of 52.04% over the 2009 third-quarter earnings.